Penetang has been notified that the OPP are terminating their contract with the municipality effective December 31st. Mayor Kerr recommends an earlier date so that recruitment can begin as 16 other communities including Barrie will be receiving the same notice. Sixty Five years a member, R.G. (Gilmore) Nesbitt, former lodge secretary was honoured with a 65 year jewel by Vern Holroyd the present secretary of the Midland IOOF lodge. Presentation was made at St. Andrews Hospital where Mr. Nesbitt has been a patient for the past year as a result of hip surgery. L to R, Ira Rumney, Stewart Glassier, Noble Grand of the Midland IOOF Lodge, Vern Holroyd secretary, J.W. Bald, Edgar Smyth, Don Argue, Percy French, Eric Heels. Omery Caudle and Thomas McCabe. Seated in front, R.G. Nesbitt and Hedley Whittle. Annual Y’s Mens Music Festival has 450 contestants entered. 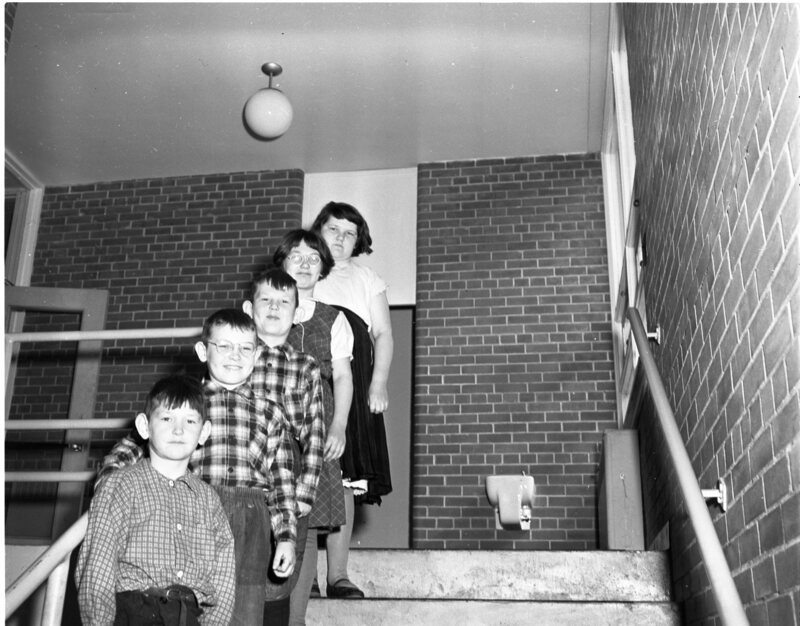 Students in the south staircase of the new addition to Regent Public School. Five members of one family, Roy Hutchinson 7, Sidney 8, Ross 10, Reta 11, Lillian 12, Lottie their 6 year old sister was home with the measles. 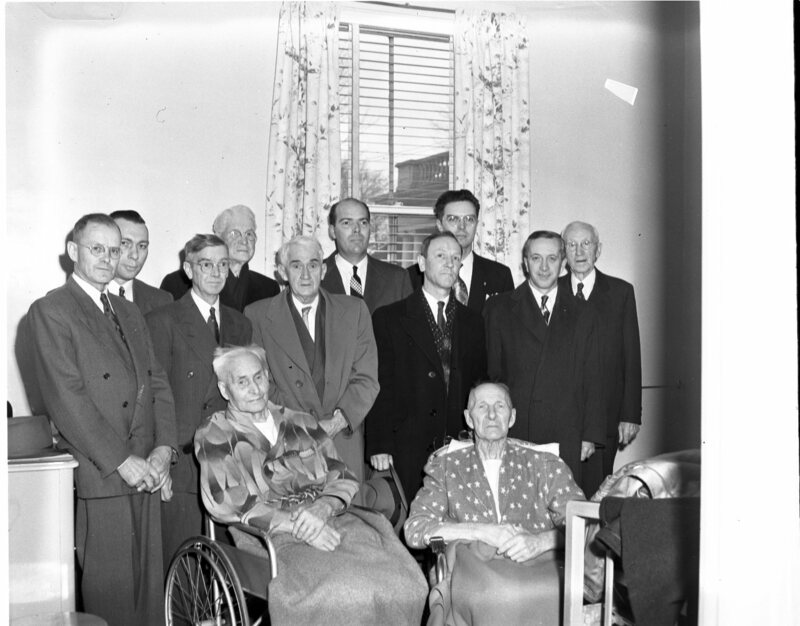 Sons and daughters of Mr. & Mrs. Roy Hutchinson of 289 Queen Street. Ladies Auxiliary of the Royal Canadian Legion Branch 80 donate $700.00 to the St. Andrews Hospital building fund. 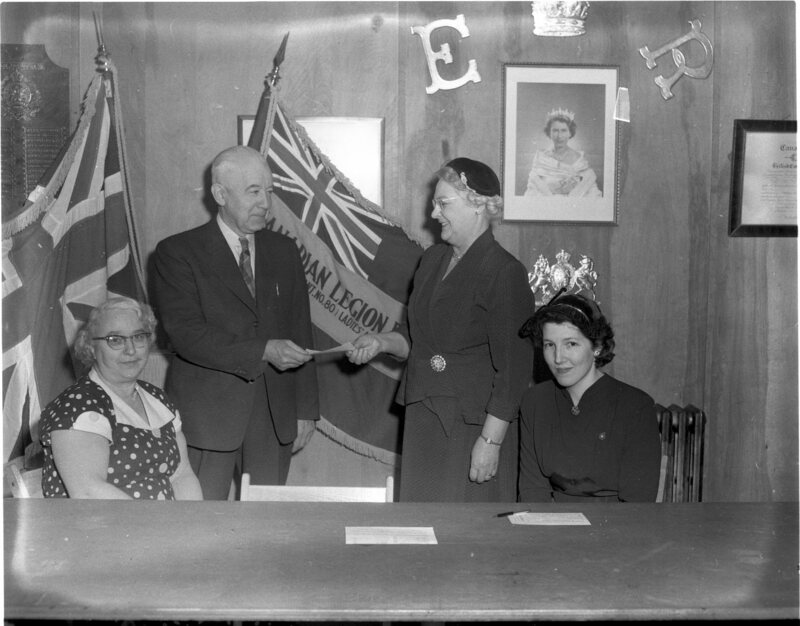 Mrs. Len Wiles treasurer, Mrs. William Baker president, Mrs. Len Maheau secretary and Mr. V.G. Edwards chairman of the hospital building fund. 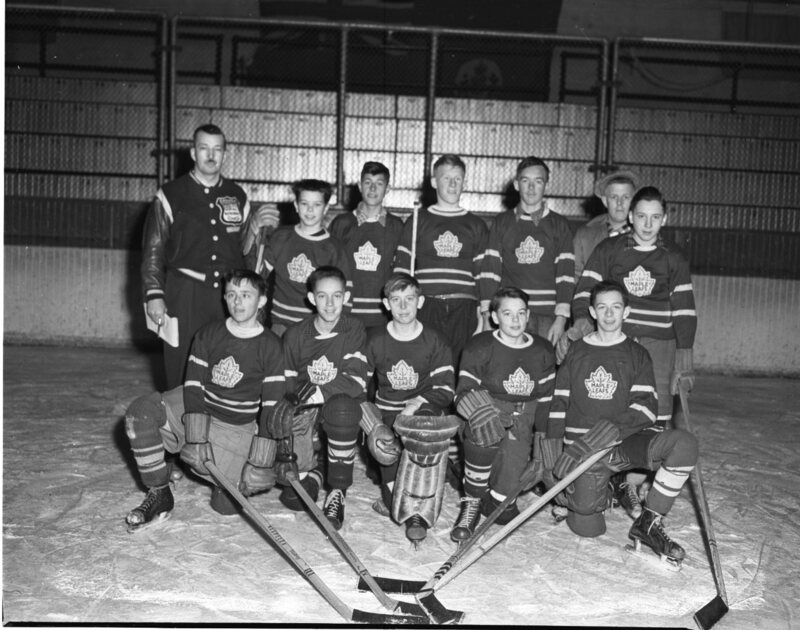 Runners up in the Midland Little League Hockey finals, Toronto Maple Leafs of the NHL, front row, Doug Dwinnell, Bill Gray, Wayne Ferris, David Bertrand and John Nicholls. Back row, Rev. Len Self, league director, Peter Davis, Paul Marchildon, David Henry, Alvin Robillard, Charlie Henry coach and Rodney Rankin. 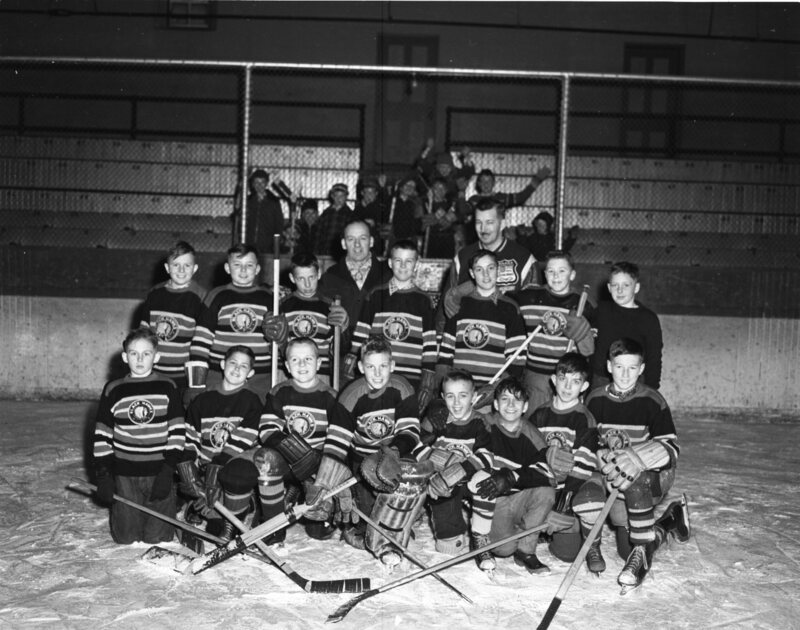 Runners up in the Midland Little League Hockey finals, Cleveland Barons in the AHL, front row, J. McConnell, D. Hilliard, Tom McCullough, Ross Clute, F. Burgie, W. Lavigne, David McIlvarey and W. Schell. Back row, Bjorn Pettersen, B. Montgomery, C. Ward, C. Hamilton, Tom Jenkinson, John Argue and J. MacKinnon. Coaches L. Girard and Rev. Len Self.